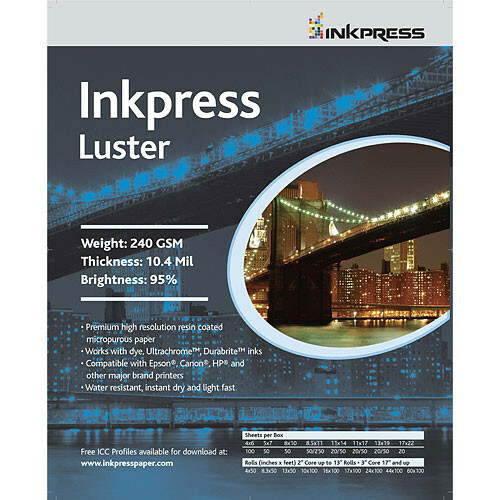 This 20-sheet pack of 17 x 22" Luster Paper from Inkpress Media features resin-coated microporous paper with a luster surface finish. This paper has a basis weight of 240 gsm and a thickness of 10.4 mil as well as a 95% brightness. Additionally, the paper is water and light resistant for durability and instant drying for immediate handling. Box Dimensions (LxWxH) 22.3 x 17.4 x 1.1"
Luster Paper (17 x 22", 20 Sheets) is rated 4.6 out of 5 by 7. Rated 4 out of 5 by North GA Photo from Good Paper I don't purchase paper often, I outsource 99.9% of printing, but I needed something in a rush and wanted to start at the bottom price point and I'm very happy with it. It prints on a great Epson printer and I don't have any complaints with it. Rated 5 out of 5 by Carol the Nut from Great product Beautiful paper. Rich colors, great saturation, all over a perfect ink jet paper. Rated 5 out of 5 by MT Joe from Excellent paper Great paper for producing professional images. I will use this brand for life!